Samsung UE37C6505 review | What Hi-Fi? If how slender your screen stands – or indeed hangs – is of paramount importance to you, then take note: the Samsung UE37C6505 is just over 3cm deep – and it's something of a looker. It's worth pointing out that this particular model is exclusive to the Dixons Group – Dixons, Currys and PC World – though we're assured by Samsung that all UE37C65 models will have the same specification but with minor cosmetic differences. First physical impressions are good then, but turn the set on and we get our first wince-inducing issue: the backlight. We can see little blotches of light across the screen – we've seen worse and most of the time it's not noticeable, but with dark scenes some of the patches of light towards the extremes of the screen are apparent. Like most new sets, it's full to bursting with the latest features and functions. It's an LED, Full HD screen, with four HDMI inputs, but that's just the beginning. It's DLNA-capable, allowing you to stream music and movies from a PC over your home network – Samsung calls this All Share – or you can use the USB connection to plug and play videos, pictures and tunes. Samsung's Internet@TV gives you access to online ‘apps' from the likes of Twitter and YouTube, plus there are a host of sound- and picture-processing features. We eventually achieve a subtle and detailed image. 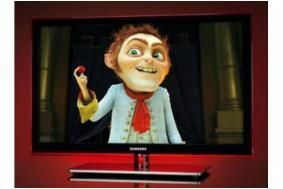 Off-air broadcasts from the Freeview HD tuner are stable and solid. And, showing the sublime Blu-ray of Avatar, the wide range of colours on display is superb and attention to texture and detail is excellent. Motion isn't handled as smoothly as some rivals and it's not as strong with deep blacks or bright whites, but it's an easy-to-watch image. Switch to a DVD and Inglourious Basterds shows the Samsung has a strong scaler, while also keeping sharp edges and revealing plenty of insight. Sonically it's adept, too, with body and authority to the sound. It isn't as strong off-axis as others here, which might be important to some. This set has plenty going for it, not least one of the best tuners around but it lacks a little punch with very dynamic scenes, and needs a steadier hand with fast motion to be top of the pile.